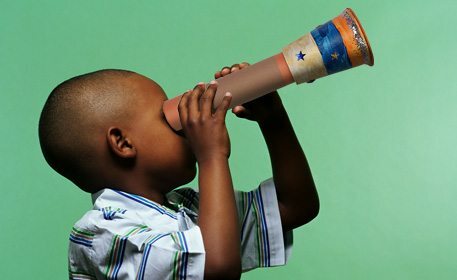 You will look through the world a different way when using this hand-crafted telescope made of recycled materials in honor of Columbus Day! 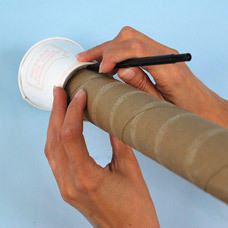 Place your cardboard tube on the bottom of your paper cup and trace around the tube using a pen. Remove the tube. Draw a line dividing the circle in half, draw another line to create quarters and (2) more lines to split the circle into (8) sections. 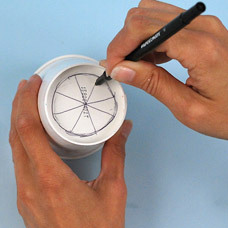 Have an adult use a craft knife to cut the lines inside the circle to create (8) flaps. Push the flaps inward. 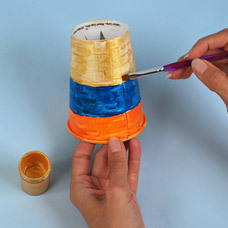 Check to make sure that the cardboard tube will now fit into the hole that was created with the craft knife. The tube should fit snug, but still be able to move and turn. Remove the tube and set aside for later. Now you will decorate the lens of your telescope. 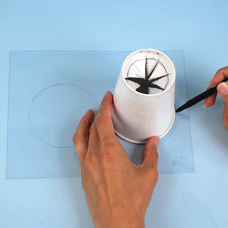 Trace the top of your cup onto a piece of acetate. Acetate is a clear material you can find in the office supply section, or recycled from the fronts of products, like toy packages. For your telescope You will need to create (2) circles. Cut out the circles and set aside. 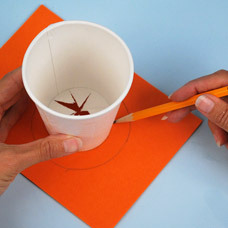 Trace the top of your cup onto an orange foam sheet using your pencil. 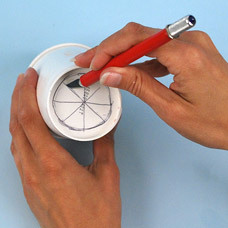 Turn the cup over and center the cup inside the circle you just traced. Trace the bottom of the cup. Cut out the large outer circle. You will need to cut out the inside of the foam circle without cutting the outer edge of the circle. 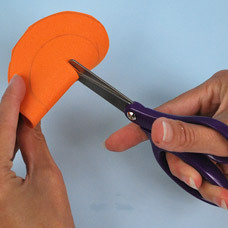 Gently fold your foam circle and use your scissors to cut the middle. Run the craft glue around one side of your foam circle and glue one sheet of acetate to the foam circle. 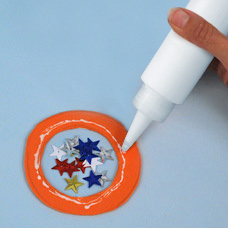 Turn the foam circle over and sprinkle some Patriotic Star Sequins into the middle. Line the outside edge with glue and adhere the second acetate circle on top. Set this piece aside. Paint your cup with Acrylic Paint and let dry. 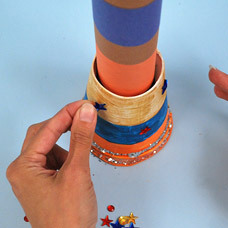 Wrap construction paper around your cardboard tube and glue. Leave about 3 inches at the end of the tube uncovered so you can insert your cup. 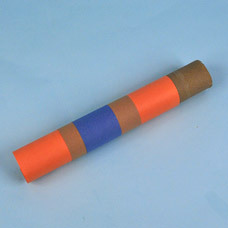 You can wrap different colors of paper on top of each other to create a design as shown. 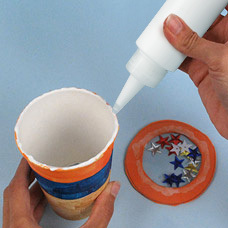 Put craft glue along the top edge of the cup and glue the foam circle on to the top of the cup. Decorate your cup. Apply glue around the top rim of the cup and sprinkle Silver Glitter to accent. Add Acrylic Jewels around the cup for added decoration. 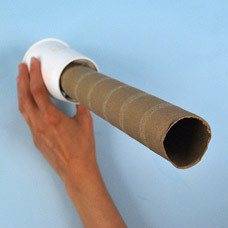 Insert your cardboard tube into the hole. 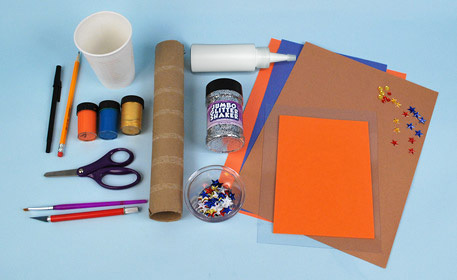 Once dry you’ll be ready to explore your surroundings with your Telescope craft! Spin the cup to see different views with the star sequins inside your lens!